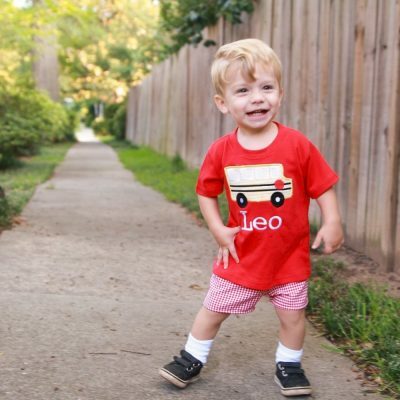 Boys navy cotton bodysuit or shirt with a school bus appliqued on it. The yello wgingham shorts are a perfect match. You can order the complete outfit, or just the top or shorts. There’s also the option to add a name under the bus! Price adjusts in bottom right corner based on your selections. Shipping Class A (see shipping options in cart at checkout). 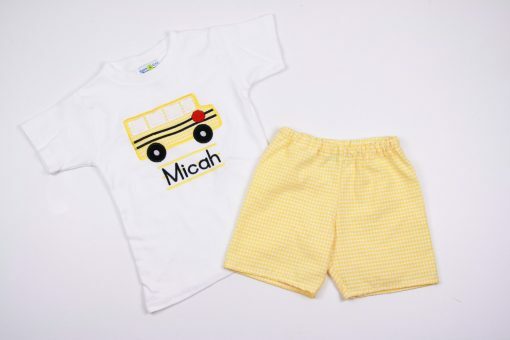 Our first day of school outfit featuring the yellow gingham school bus is perfect for back to preschool, preK, or Kindergarten! 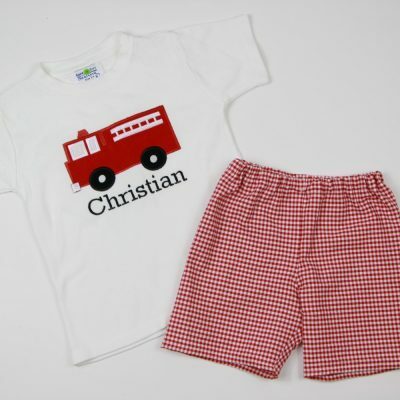 A white shirt or bodysuit is appliqued with a yellow gingham school bus. You can add a name under the bus to make it more personal. You can also choose to add the matching yellow gingham shorts to make a great summer outfit. Bonus: the shorts will go with other shirts you already own! The shorts are made of 100% cotton gingham. They have elastic waist for an adjustable fit. 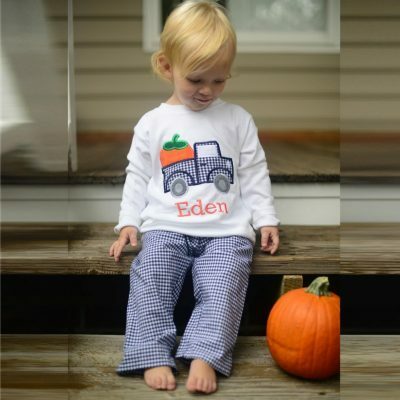 The tees and bodysuits are 100% interlock cotton and super soft to wear. Our outfits are completely machine washable and dryer safe. You can wear it often and with confidence, knowing that our high quality fabrics can be washed again and again. 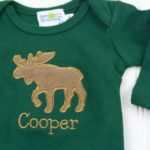 Add a monogram or name under the applique by selecting one of those choices at checkout. 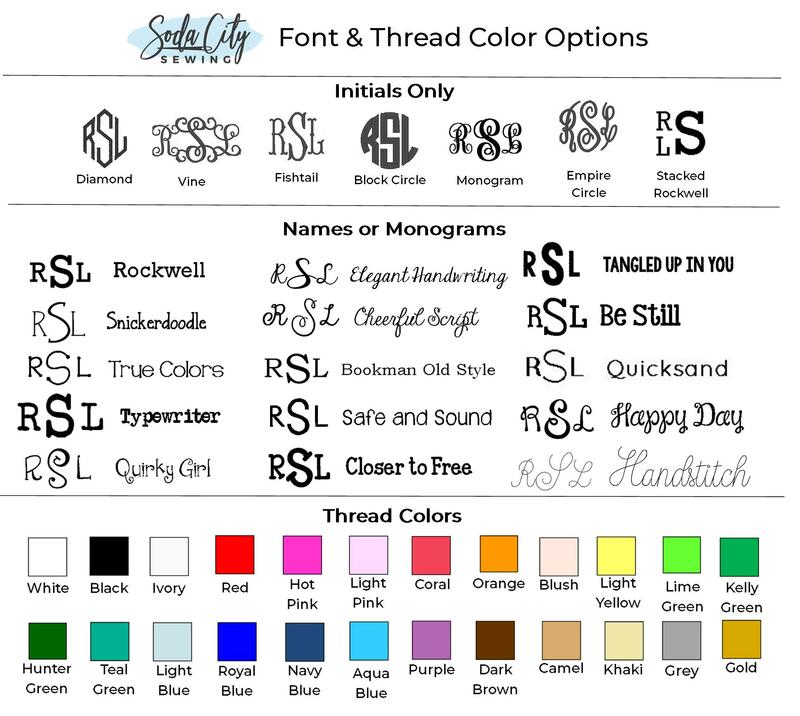 Font Choices are available here: https://sodacitysewing.com/fontsizing/ or in the last picture. Please leave your font, thread color, and name at checkout. OPTIONS: You can order the top, add a name, and/or add the shorts. 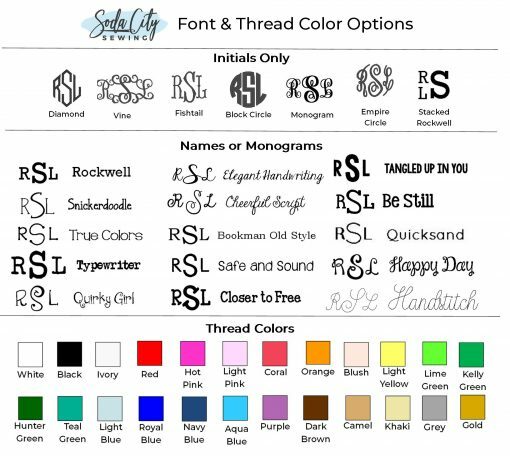 The thread color and font you select would be for the name or initials embroidered on the outfit under the sail boat. If you select No shirt or No Shorts it will take that amount off of your total, the price adjusting in the bottom right corner. Thanks for visiting Soda City Sewing, where we make customized first day of school outfits just for you!